What is a real nappy? •A real nappy is a washable nappy that can be reused, reducing your financial costs and reducing the amount of rubbish you produce. •Real nappies are also called as cloth nappies, washable nappies or reusable nappies. •Most real nappies are composed by a soft absorbent nappy, a flushable or washable liner and a breathable waterproof cover (wrap). •The nappy liner is put inside the nappy to catch the solid waste and helps to keep moisture away from the baby’s skin. Biodegradable flushable paper liners can be put down the toilet if with solid waste, if are only humid you can put them on your waste bin. •The waterproof outer cover (wrap) are made from different materials such wool, fleece and breathable PVC. This is the funniest part of nappy are there are many colours and designs available. •Modern designs fits perfect and are quick to use. You can select the easy fastenings as Velcro, nappy grips or poppers. •Made in natural materials real nappies are easy to wash and some of them have very quick drying. -Flat nappies – need to be folded first and put inside a breathable waterproof wrap. Flat nappies is the cheapest option. You can select pre-folds to the traditional terry square. -Shapped nappies. Need a separate waterproof wrap. The shaped is washed every time is used, while the wrap could remain clean between changes. -All in One. Have cloth inside stitched to a waterproof cover. Are easy to wash in the washing machine, but can take longer to dry. – Pocket/ Stuffable nappy- A waterproof wrap with a built in pocket which is filled with absorbent material. The stuffing could be a flat nappy or boosters. They are quick to dry as the stuffing is removed before washing. What do I need for getting started? •A nappy bag if you want to always use them when you are out. •You could save around Eur 1.500 by using real nappies rather than disposables. An initial outlay to buy your real nappies is necessary. Anyway this is a one off payment and means you are not constantly paying out for disposables on a weekly basis. •Basic real nappies can cost less than Eur 2 each. All in One and pocket models cost around from Eur 15 to Eur 26,00. Including the refill. •Home washing cost around Eur1 per week (including electricity cost, detergent and depreciation on your washing machine). •You can achieve further savings by using the same real nappies on your second baby. •Second hand nappies can be found on different websites. Washing and drying real nappies? 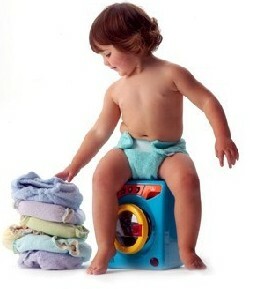 •Real nappies do not need to be soaked, boiled, scrubbed or machined at 95º. Washing machines and detergents are efficient to be washed at 40º-60º. •Biodegradable nappy liners can be flushed down the toilet with any solid waste. Washable liners can go in the wash with your nappies. •Soiled nappies can be put through on a rinse cycle prior to the rest of the household wash being added. •You can do more using ecological detergents. Actually in the market there are many options at reasonable prices. Think that this detergent can be used making laundry to all family avoiding allergic reactions. •If you are only making a full load of nappies can easily use baking soda and white vinegar ( pun in separate basket otherwise one eliminate the effect of the other). You will see they will be clean and odourless. •How often you change your baby can also determine whether they get nappy rash, not the type of nappy they are in. •Your baby is no more likely to get nappy rash from wearing real nappies than from disposables. Do they real nappy leak? •Select carefully the right size according your baby shape to avoid leakages. There is a wide choice of products available so choosing the right one will not be difficult. •You can use booster pads to make the nappy more absorbent if needed. They are especially useful at night. If you have any doubt to select the model contact a local agent or navigate through websites and read forums beforehand. Pingback: Real diapers : it’s time of real change! He probado los pañales pero no me duran ni las dos horas puesto en el bebé ya que se humedecen demasiado. Estoy equivocada en la talla?, Necesito más absorvente? 4. si es niño ten prsente que hay que reforzar el absorbente en la parte de adelante. Cloth diaper is something that has an inner absorbent sheet attached to an outer waterproof layer with flexible closures. Such diapers are used for babies only. If you need some advice on how to use cloth diapers, just ask me.